(NaturalNews) Continuing in the Natural News tradition of hilarious satire commentary on the insane world around us, I've just released a brand new song and music video entitled, "Workin' for Ebola." Click here for the music video and song lyrics. You'll also find a downloadable MP3 file. But I'm warnin' ya! This song sticks in your head and will infect your mind for days to come... sort of like Ebola. But don't worry, my music video isn't airborne yet and the CDC says isolation isn't necessary. Click here to watch the music video on YouTube. As you've come to expect, I wrote and performed the song lyrics and vocals, and I even played the part of Dr. E. Bola (the mad scientist) in the music video. Professional actor Will Pollard from Austin is the talent dancing in the hazmat suit. The guy has a million moves and was a blast to film for this music video. The muppet is the same muppet I used in the "Just Label It" video from a few years back. He's about to be resurrected in a new character role for some upcoming childrens' education projects that I'm putting together now. Here's a snippet of some of the parody lyrics. 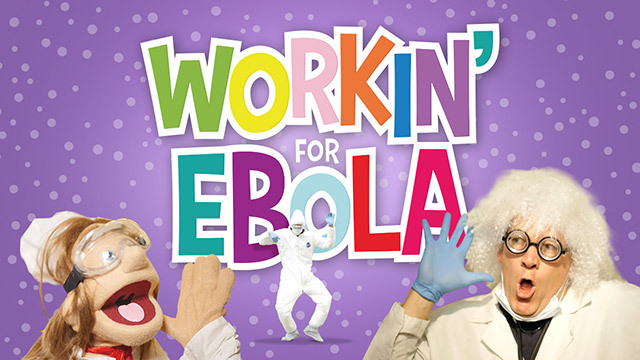 Read the full lyrics on the Workin' for Ebola song play page.